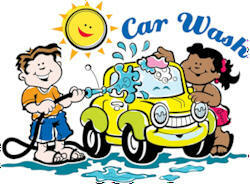 DIY - Car Wash fundraiser! Everything you could possibly want to know is available in a free 46-page booklet titled ‘How to Run a Successful Car Wash Fundraiser‘. A complete step-by-step guide to preparation, the wash itself, and follow-up. Chapter 1 – Preparation: Picking dates and times, rain dates, finding volunteers, pre-sale tickets, wash-a-thons, organizing (person in charge, publicity coordinator, location & site locator, supplies person, ticket sales captain, shift scheduler, post car wash person and environmental coordinator), agendas for meetings, picking a location, insurance requirements, ticket graphics, and hours for the wash.
Chapter 2 – Environmental: History, storm water discharge, what’s in the water, choosing car wash products, water conservation, and using a pressure washer versus a garden hose. This was written for California residents so you may need to make some adjustments. Chapter 3 – Presale/Donations: Motivation/pep talks, incentives, parent’s help, teams, divide and conquer, overlap problems, other sales locations, and profits/goals. Chapter 4 – Publicity: Public service announcements, local newspapers, cable stations, newsletters, faxing, and flyers. Chapter 5 – Day of Event: Set up, layout, supplies, supervision, organizing washers, signage, public address system, donation cans, hot dogs, bake sale, pancake breakfast, traffic flow, flyers, cash, media, counting cars, and vacuuming. Chapter 6 – Post Car Wash: Clean up, towels, announce your earnings, thank you letters, certificates, property owners, city hall, fixed site car wash owners, letter to the editor, collecting pledges, evaluation, and setting a date for next years car wash.